We hide the tail of email address Mrs. Carol CHU to protect our clients' privacy online. Votre message a été bien envoyé à Mrs. Carol CHU . Nous vous prions de bien vouloir attendre son retour avec patience. We are glad to have chosen Asiatica as our agent for our tour. Ms Hue was prompt in her email replies and helped us carve out a comprehensive itinerary. As for your good self, Ms Linda, we were very pleased with your prompt replies on whatsapp and your initiative to help us solve problems. 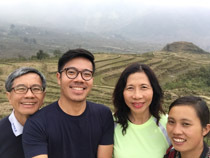 I am particularly grateful you could help switch our itinerary so that my son could go to Trang An before returning to Singapore. All 3 guides - Mr Phan Minh Tan in Hanoi, Ms Ta May in Sapa, and Mr An Dinh in Central Vietnam were punctual in their pickups and flexible in their plans. Mr Tan was particularly outstanding in his knowledge of the history of Vietnam and shared with us many pieces of interesting information. His command of English was good so we could understand him easily. He was professional and took very good care of us. We highly recommend Mr Tan for his excellent services as a tour guide in Hanoi. Ms Ta May is very pleasant, patient, helpful and knowledgeable. She went the extra mile to ask permission for us to enter a village home where a wedding was being held, and also to enter a Black Hmong home. She even showed us her home and that gave us a valuable insight into how the villagers live. We highly recommend her services as a Sapa guide. Mr An Dinh arranged our My Son excursion such that we arrived there on time for the slide presentation and entertaining cultural show. That was a nice touch. All drivers were punctual in their pickup and helpful with our luggage. We felt, though, that our driver in Sapa was rather reckless. Aphrodite Cruise was an absolute delight. That was a great recommendation by Ms Hue of Asiatica. We enjoyed their splendid service and delectable cuisine. Two thumbs up for Aphrodite Cruise! You are already aware of the trouble we had with Calypso Grand Hotel - that was a great disappointment. It was surprising that they had not contacted you about the change in hotel before they tried to persuade me to switch hotel. After all, the booking was done by Asiatica, not by us. The disappointment was that when I asked the Calypso Grand person in charge what rooms we would be getting at La Beaute, she said a family room and a deluxe room. But when we arrived at La Beaute, we got 2 deluxe rooms. I knew the family room was a free upgrade and it was not what we had booked. But she said herself we were going to get a family room and a deluxe room. That was why we felt let down. They may have given us their so-called best rooms but they were not what was promised. We experienced great service at Paradise View Hotel in Sapa. We were pleasantly surprised to have a proper hotel room and bath in Cosiana Hotel (and not just a day room) to shower and freshen up after our train journey from Lao Cai. Mr Phan Minh Tan had arranged that Cosiana packed our breakfast for us to take away because we had to rush off to the airport. That was a really good idea of Mr Tan, and Cosiana Hotel happily obliged us with 3 takeaway breakfasts! You were also aware of the uncomfortable rollaway 3rd bed with a thin mattress at Saigon Quang Binh Hotel in Dong Hoi. I think for triple rooms, it's best to provide proper beds for 3 people, without having to use rollaway beds. Serene Palace at Hue was outstanding in service and room provided. We enjoyed our stay here very much. Ancient House Resort Hotel gave us a room on the ground floor so there were mosquitos! Also the 3rd person in our group was again provided with a rollaway bed though I had already highlighted the problem at Saigon Quang Binh. Fortunately, the mattress on the rollaway bed was sufficiently thick so it wasn't too uncomfortable. On the whole, we enjoyed our tour of Vietnam and would not hesitate to recommend Asiatica! Thank you for a beautiful tour of Vietnam! Attached: 1st photo at Halong Bay and 2nd photo at Sapa with guide Ta May. Kindly let me know before you use the photos in any material. Upon arrival in Hanoi at 15h40 (VN 662), you will be welcomed by our guide and transferred to your hotel (check-in at 2pm). The rest of the day is free for your own exploration. Overnight at hotel in Hanoi. Pick-up at your hotel around 07.30-08 am by shuttle bus to Ha Long bay. On arrival around noon at the pier, you will meet the Aphrodite team and crew. Welcome drink and short speech about the vessel’s facilities and services. Check-in and enjoy the view while the cruise heads straight to the South. Lunch will be at the panoramic restaurant on the third deck. In the afternoon, the cruise will reach the village of Cua Van. Get an insight of the local life, strolling aboard a sampan boat, around a typical Halong bay fishing village. Cua Van is a stand out example of community-based and sustainable tourism in Halong bay. There is an option of 1 hour kayaking around Cua Van Fishing village instead of the sampan stroll. Back onboard the junk, you will have time to relax, enjoy the spa and massage service and/or the Happy Hour at the bar. The cruise will now head to the moorage area, near Coconut Beach Island. Dinner around 19h00. Overnight on board. Tai Chi session at 06h30. Breakfast buffet will be served at the restaurant. Then, our local guide will take you to explore a beautiful cave in Halong Bay. Back on the junk, it will be time to get prepared for the check out. The cruise will head back to Tuan Chau pier. Check out time then Brunch will be served around 10am. Transfer by shuttle bus back to Hanoi. The trip ends at your hotel at 16h00. Free time for your own. Overnight at hotel in Hanoi. A full day spent for visiting Hanoi – the politic, economic and cultural capital of Vietnam. Pick up at 08h00, starting with Tran Quoc Pagoda- the oldest pagoda in Hanoi. Then, visit Hochiminh Mausoleum, and the Imperial Citadel of Thang Long. In the afternoon, we discover the Temple of Literature- a complex of the Confucius Temple built in 1070 and the first Royal National university in Vietnam built in 1076. This temple and its beautiful garden provide an opportunity to learn more about madarin education in Vietnam since 1000 years ago and to relax in tranquility. After that, walk around the alleys of Hanoi Old Quater, visit Hoan Kiem lake and Ngoc Son temple or Jade Mountain temple situated in the heart of Hanoi. Water puppet show in the evening (We offer the tickets, then you will walk to the hotel). Overnight at hotel in Hanoi. Pick up at 08h00, you will drive to Ninh Binh. We firstly head to the pier where rowing boats are ready to take us on a 2.5 hour exploration on the picturesque waterways of Trang An Ecological Tourism Site. Limestone mountains covered in lush vegetation, the emerald water, caves and rivers create a mysterious, seemingly enchanted waterscape. You will disembark our boats and walk to visit two temples dedicated to King Dinh and Le in Hoa Lu, which served as the capital of Vietnam during the 10th century. Transfer back to Hanoi, directly to the station for your night train to Lao Cai. Overnight on board of a four-berth airconditioned sharing cabin. Note : Your son Daniel will be picked up at 09h30 at hotel by anotther driver and transferred to the airport for his flight home at 12h20 Tiger Air TR 2309. We arrive at about 5.30 am at Lao Cai train station. Pick-up by our local guide and driver then transfer to Sapa. Breakfast at the local restaurant. After a rest, we will leave our luggages at hotel then begin to discover the surrounding villages of Y Linh Ho, Lao Chai inhabited by Black Hmong and Ta Van village, home to the Dzay (Giay) ethnic people, located at the heart of the Muong Hoa valley. You can admire fabulous views of the valley, terraced fields and winding streams. Ovenight at hotel in Sapa. Breakfast at hotel. Then, we will continue to visit Ban Khoang village, a still authentic and isolated region. This village is inhabited by Black Hmong and Red Dzao. Tour around the village and continue through the tropical forest and the valley to the village of Ta Giang Phinh. This is where you will have a unique opportunity to experience the authentic culture and daily life of local communities and enjoy amazing landscapes, waterfall, terraced rice fields... Transfer to the station for your night train to Hanoi. Overnight on board of a four-berth airconditioned sharing cabin. Arrival in Hanoi around 05h00, you will be taken to the hotel for early-check-in. Pick up at hotel at 06h15, then transfer to the airport for your flight towards Dong Hoi (Quang Binh province) VN1591 08h15/09h40. Upon arrival, pick up by our driver and guide then transfer to the hotel in Dong Hoi. In the afternoon, visit Paradise Cave which is newly discovered in Quang Binh Province. Its length is 31 km. The widest spot is about 150 meters. Rest of time at hotel. Overnight at hotel in Dong Hoi. After having breakfast in hotel, we will take the road to Quang Tri to visit DMZ. During the Vietnam- American War, the Ben Hai River is the dividing line between North and South Vietnam. He made a demilitarized zone 5 km away from each edge of the river. However, during the war, the area south of the DMZ is one of the bloodiest battlefields. This tour to DMZ will take you back to the war sites including : Ben Hai River, Hien Luong Bridge, Vinh Moc Tunnel, Khe Sanh Combat, Ho Chi Minh trail, Rockpile Fire Support Base. Finally, you will have the chance to visit Van Kieu ethnic minority in central Vietnam. Continue to Hue where you will reach at late afternoon. Check-in and overnight at hotel in Hue. After breakfast, your guide will pick you up at the hotel at 8:00am for a cruise on the romantic Perfume River. Visit Thien Mu Pagoda, also known as “Heavenly Lady Pagoda and visit Tu Duc Tomb, one of the most beautiful architectural constructions of Nguyen dynasty, then Tu Hieu pagoda on the way back. In the afternoon, we will continue our discovery of Hue with Imperial City - the architectural complex inlcuding : Flag Tower, Ngo Mon Gate, Nine Dynastic Urns, Nine Holy Cannons, Thai Hoa Palace & Forbidden Purple City (Tu Cam Thanh). Overnight at hotel in Hue. Breakfast at hotel. Continue to visit Minh Mang Mausoleum, one of Hue's finest royal tombs. Then drive along the Mandarin Road, a scenic journey from Hue to Hoi An, which allows you to see a picturesque Vietnam with stunning beachs and lust tropical forest. Visit Lang Co beach and Marble Mountain on route before reaching Hoi An ancient town, once an important international trading port and now a charming riverside town, reflecting the combination of Chinese, Dutch, Japanese and Portuguese culture. On arrival in Hoian, walking inside the old trade center town, you will follow the narrow lanes lined with centuries-old houses influenced by Chinese, Japanese, French and European architectures and visit its numerous places of interest: Japanese Pagoda Bridge, Chinese street, Phung Hung old house, Hoi An market, the ancient port and Chuc Thanh pagoda – the oldest pagoda of Hoi An (1454), built with Chinese bonze. Overnight at hotel in Hoian. Breakfast at hotel. Our guide and car will pick you up at your hotel and take you to My Son Holy Land, once the capital city of the Champa Kingdom, between the 4th and 12th century. My Son is a large complex of religious relics that comprises more than 70 architectural works. They include temples and towers connecting to each other with complicated red brick designs. Back to Hoian city for free time. Afternoon transfer at 15h30 to the airport for your departure international flight at 18h30 by Silkair MI 633.